Though it’s officially the end of summer, the warm weather is still here. And knowing how lucky we Australians are, it could be that way even well into autumn. The soft rays of sun and refreshing air make this time even more appealing than the beginning of summer. If you’re like me, I’m sure you want to fully enjoy the last sunny days before the gloom of winter arrives. 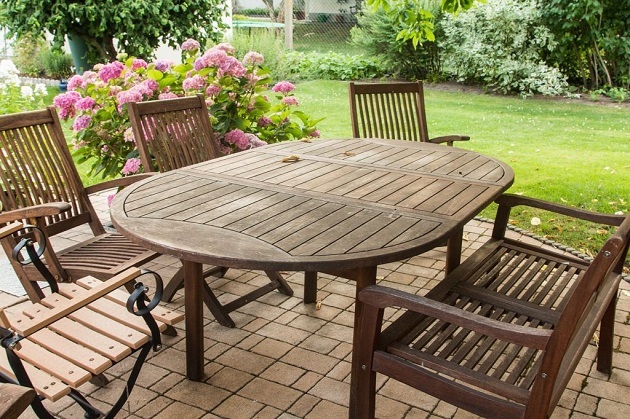 So whether you own a beach house, a balcony, or just a deck in your yard, quality furniture can help you transform your outdoor area into a lovely relaxation spot you’d never want to leave. Though today there’s a great variety of outdoor furniture made of materials ranging from plastic and metal to wicker and timber, the one that is of truly superior quality is teak. Here are some reasons teak has long been the top choice for outdoor furnishings. People prize teak for the fact that it is impervious to the outside elements. But why is that so? The reason lies in the abundance of natural rubber and oils found in the tight grain of the wood. It’s no secret that all woods contain oils (think maple or tea tree), but teak is different in that it can retain those oils and rubber even after it’s been processed into furniture. The result are sturdy teak outdoor tables, chairs, benches and other pieces of furniture with amazing weather-resistant properties. This natural protection acts as a shield against water, rot, insects, and sun damage, ensuring the furnishings last year after year. The high amount of oils also give teak a beautiful shine and unique texture which cannot be found in other woods. The warm colour teak comes in is another attractive selling point. When new, teak outdoor tables, chairs or benches have a buttery gold colour. If you want to preserve this look, make sure to apply a sealant to your furniture. Otherwise, teak can change colour from being exposed to the sun and turn silvery grey over time. Some people love this look as it has a charming, rustic feel to it. There’s also the alternative of buying pre-weathered furniture which has already received its beautiful grey colour, making it easier for you to pick accent pieces that match. Out of all furniture materials, teak is the one that requires the least amount of maintenance. Cleaning it once in a while and after heavy rains or storms can prove to be enough for preserving its good looks. You can do this with the help of a bristle brush or a cloth and some diluted household cleanser. But since hosting outdoor dinner parties and BBQs is bound to end up in your furniture being covered in stains, it’s always good to have a special teak cleanser that can remove them without any problem.